Currently, I’m on a project team that’s designing, building, and implementing call-centre software. You can probably imagine the call-centre experience from the customer side—we’ve all had our share of call-centre experiences. I’ve been looking at call centres from the other side—from the perspective of the customer-service agents and their employer. I started by observing customer-service agents on the job. At the site I visited, the agents were using a command-line system, and the agents typed so fast that I couldn’t make sense of their on-screen actions. I signed up for several weeks of training to become a novice customer-service agent. This allowed me to make sense of my second round of observations, and appreciate how efficiently the agents handle their customer calls. It also helped me to identify tasks where design might improve user performance. For example, after each call the agent decides why the customer called, and then, by scanning lists of main reasons and detailed reasons, “wraps up” the call, as illustrated. I measured the time on task; the average wrap-up task is nine seconds in duration. Nine seconds may not seem long, but let’s make a few (fictitious but reasonable) assumptions, and then do a little math. If the average call-handling time is five minutes, or 300 seconds, the 9 seconds spent on call wrap-up is 3% of the total handling time. A full-time agent could spend 202,500 seconds—that’s 56¼ hours per year—on call wrap-ups, assuming a 7½-hour workweek and no lulls in incoming calls. Since call volumes vary, there will be times when call volumes are too low to keep all agents taking calls. The customer-service agents have other tasks to complete during such lulls, but if we assume this happens about a third of the time, we need to round down the 56¼ hours accordingly. Let’s choose a convenient number: 40 hours, or one workweek per agent per year. One workweek is 2% of the year. Based on this number, a redesigned call wrap-up that takes only half the time would save one percent of the labour. Eliminating the wrap-up entirely would save two percent. That frees a lot of hours for other tasks. A similar calculation on the cost side (n hours to design and implement changes) leaves us with a simple subtraction. Projected saving minus cost is the return on investment, or ROI. Comparing that number to similar numbers from other projects that we could tackle instead—the opportunity costs—makes it easy to decide which design problem to tackle. Peter Merholz of Adaptive Path explained his view that customer experience is an investment, not a cost, in an article this week on Harvard Business Publishing’s site. I adapted one of the “linking elephants” illustrations in the Merholz article by adding another row of boxes and text to illustrate what Merholz says: it is design that motivates people to modify their behaviour. I also added an ROI or return-on-investment calculation. Design makes the difference. By “design” I don’t just mean how it looks; I’m including the mental model (how the site visitors or users think the site meets their needs), the workflow and interaction (how users complete the task), the experience (including how users feel about using the site), and the prototyping and formative usability testing needed to validate the proposed changes. Your business case needs to include the cost of all this design work. Making a business case can be intimidating, but the above illustration shows that it’s conceptually easy. In your business case, you predict the benefit to the company of a project, using the best estimates you can come up with. What would be your organisation’s goal? 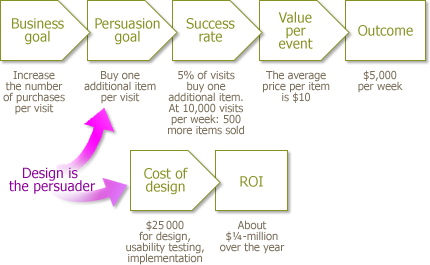 What behavioural change on the part of site visitors moves you toward that goal? What is that behaviour worth, either in revenue or in reduced costs? How many site visits do you get per week? What’s the potential impact to your organization of redesigning part of your site? After you implement the new design, you use summative testing and comparisons to get feedback on the assumptions of your business case. I recommend reading Merholz’ article on the Harvard Business Publishing.